This is an OSSI open source variety. Click for more information about open source seeds. Wishkah is a Cultivariable original variety, introduced in 2015, notable for high yield and large average tuber size. Wishkah is a mildly acidic variety, just tart enough so that you wouldn’t mistake it for a potato, but not so much that it won’t serve in just about any potato recipe. It is very slightly sweet and the yellow flesh is moderately firm even when cooked. 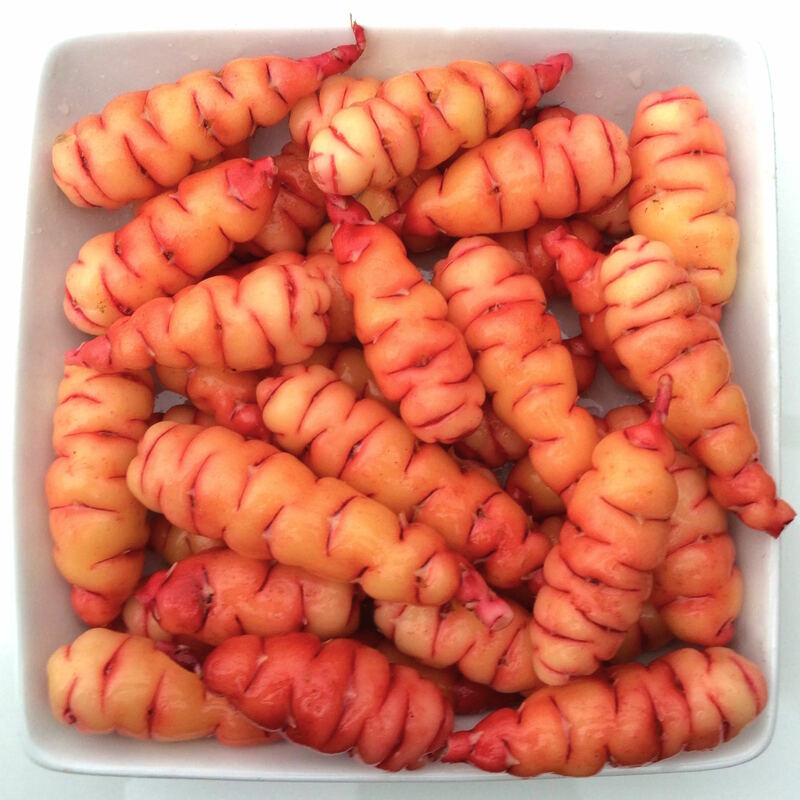 Like most oca varieties, it loses most of its color when cooked. Wishkah plants are tall, with a large number of stems, and sprawling at maturity. The tubers are formed on long stolons, which helps to prevent crowding and increases uniformity. Tuberization photoperiod is about 13 hours, making it two to three weeks earlier than most of the heirloom varieties. Average yield is 2.5 pounds. The maximum tuber length is 6.4 inches and the average tuber length is 2.9 inches. Average tuber count is 22. 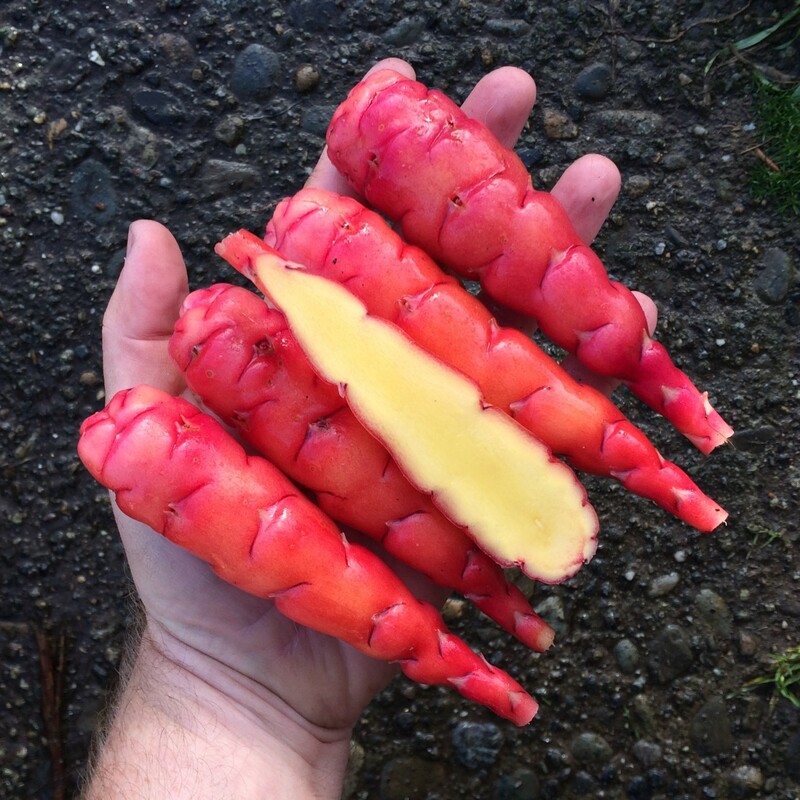 Wishkah typically produces both the highest yields and largest tubers of any variety that we grow. Wishkah is a heavy flowerer with a mid-styled flower. It is consistently among the top three producers of true seed here, along with Redshift and Siwash.